Steve Culbert – Our Regular Casting Instructor. Another two hooked – Father and Son team the Robertson’s took advantage of Steve’s four hour introduction to fly fishing, During the session they were shown how to set up and given an introductory casting lesson. The fishing started with an overview of different flies and ways to fish them – it wasn’t long before they settled on the dry fly with some good results. The flies that caught most of the fish were a CDC Hopper and a Sugar Cube. 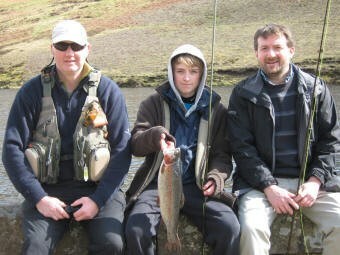 Steve is a qualified Salmon and Trout Association National Instructor and has held this certificate for fifteen years. He is qualified to teach both Salmon and Trout casting so if you ever fancy learning how to Spey cast you now know who to see. For more experienced anglers a short session with Steve can iron out any bad habits you’ve picked up and add yards to your casting reach. “The free casting dates are for anglers who are fishing on the day, for anyone who has a problem and wants to turn up for a lesson. These dates cannot be booked for an individual lessons, which means that it can get quite busy therefore I am unable to spend as much time with anyone who needs a bit more help. I am also receiving emails from people asking if they can have a lesson on their own, the price of these lessons are £35 an hour. If you want to fish after your lesson you would need to purchase a permit. Trout casting: there are two main casts the basic overhead and the roll cast all other casts are variations of these.